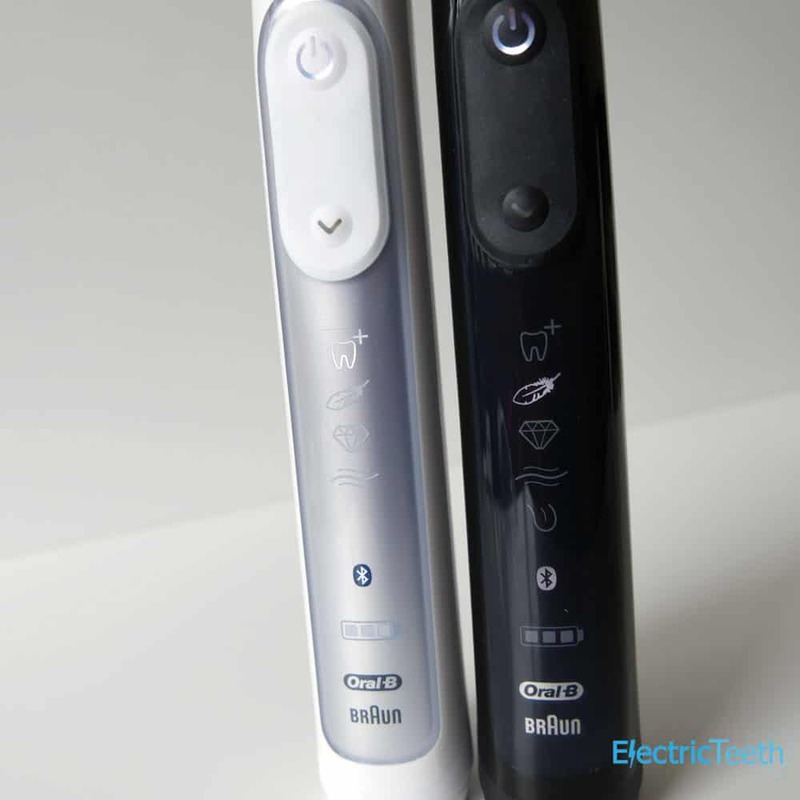 If you have read or watch any of our other hands-on comparisons, normally we would compare only two electric toothbrushes against one other. However, in this comparison we are looking at four. That said, the primary focus is on the Genius 9000 v the 8000, but as the 8900 and 9900 are such slight variations on the 8000 and 9000 it made sense to include them, as will be explained below. If you’d like to get our thoughts on either brush in more detail, check out our Oral-B Genius 9000 review and Oral-B Genius 8000 review. There is little to chose between these two brushes, essentially they are the same, it is really the box contents that for most will be the deciding factor. The Genius 9000 is the better equipped, but commands the higher price tag. Given that you tend to own a toothbrush for a few years the price difference is negligible. If you travel frequently the 9000 is the answer, but if you travel infrequently and for shorter periods the 8000 will suffice and leave at least £10 (correct at time of writing) in your pocket. Below we have listed the key differences between the various Genius models currently available in the UK. The Genius 9000 comes with 4 brush heads (CrossAction, 3D White, FlossAction & Sensitive) in the box as opposed to 3 with the 8000 (CrossAction, 3D White, & Sensitive). The 8000 comes with a basic plastic travel case but the 9000 offers a premium travel case which allows you to charge your brush and USB powered device such as a smartphone from it too. The Genius 8000 is available in white only, whilst the 9000 is available in black, white, silver, orchid purple and rose gold colour options. The Genius 8900 has 2 brush handles in the box compared to the one with the Genius 9000. The Genius 9000 has a tongue cleaning mode that the 8900 does not have. The Genius 9000 comes with 4 brush heads (CrossAction, 3D White, FlossAction & Sensitive) in the box as opposed to 3 with the 8900 (CrossAction, 3D White, & Sensitive). The 8900 comes with one basic plastic travel case but the 9000 offers a premium travel case which allows you to charge your brush and USB powered device such as a smartphone from it too. The Genius 8900 is available in white only, whilst the 9000 is available in black, white, silver, orchid purple and rose gold colour options. The Genius 8900 comes with a 2nd brush handle in the box. This brush handle is the same as the Genius 8000. The Genius 9900 comes with a 2nd brush handle in the box. This brush handle is the same as the Genius 9000. The Genius 9000 brush can be purchased in white, black, silver, rose gold or orchid purple. The 9900 comes with one black and one rose gold handle. The Genius 9000 comes with 4 brush heads (CrossAction, 3D White, FlossAction & Sensitive) in the box. The 9900 comes with 4 to (2 x CrossAction, 1 x 3D White & 1 x Sensitive). The Genius 9900 comes with 4 brush heads (2 x CrossAction, 1x 3D White & 1 x Sensitive) in the box as opposed to 3 with the 8000 (CrossAction, 3D White, & Sensitive). The 8000 comes with a basic plastic travel case but the 9900 offers a premium travel case which allows you to charge your brush and USB powered device such as a smartphone from it too. The Genius 8000 is available in white only, whilst the 9900 comes with a black and rose gold handle. The Genius 9900 has a tongue cleaning mode that the 8900 does not have. The Genius 9900 comes with 4 brush heads (2 x CrossAction, 1 x 3D White & 1 x Sensitive) in the box as opposed to 3 with the 8900 (CrossAction, 3D White, & Sensitive). The 8900 comes with one basic plastic travel case but the 9900 offers a premium travel case which allows you to charge your brush and USB powered device such as a smartphone from it too. So, what’s the difference between the Oral-B Genius 9000, Genius 8000, 8900 and 9900? If you have looked over the key differences above, you should have a good idea of what sets each of these brushes apart. Now we can dig a little deeper into each brush and explain what the effects are of these differences. I feel it is necessary to state that both the Genius 8000 and 9000 benefit from lots of great technology, fitting of a premium toothbrush of today; however neither are ‘perfect’ and if you are unsure as to exactly what you want, have a look around our site and feel free to leave a comment below if you want more assistance. A premium toothbrush does not mean a better clean, generally more modes or features are suited to some users more than others. There are many advantages to a premium brush but if price is an important factor or you do not have advanced oral healthcare needs there is often no need to go for the likes of a Genius model. If you would like high end features but paying over £100 is a bit too much, check out the latest recommendations in our best electric toothbrush guide. Now to dig into the nitty gritty of what sets these models apart. The Genius range touts some fantastic features and one of the most talked about is the Bluetooth connectivity. 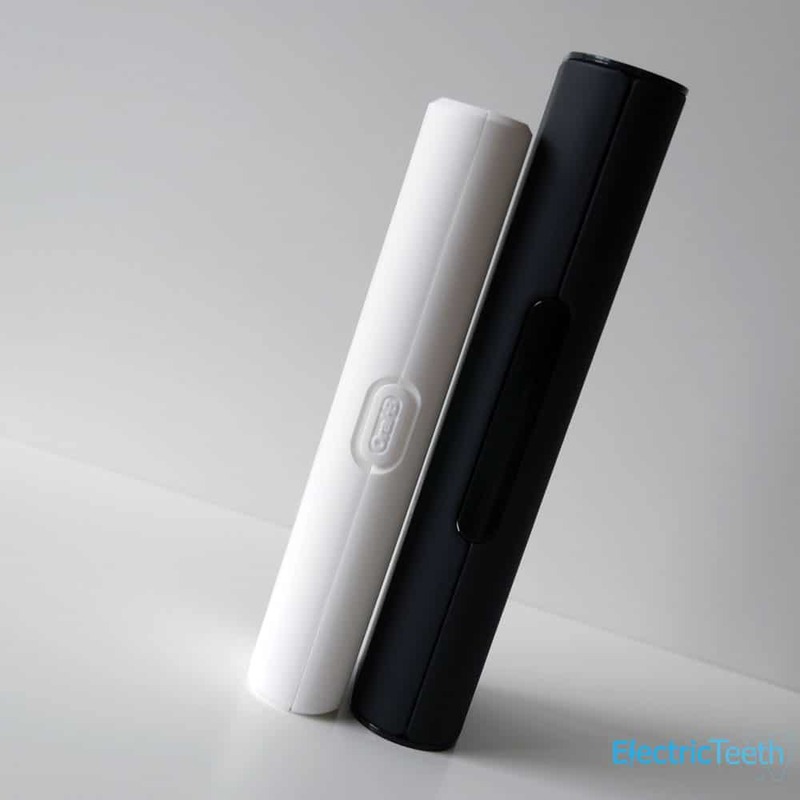 Using an Android and iOS app, the brush allows for you to not only personalise and track your brushing but to actually master your technique by using the front facing camera on your smartphone and having this watch as you brush your teeth; providing feedback on what areas of the mouth to clean better or for longer. It encourages and advises to improve your overall oral health. If you spend a minute on your front teeth, that is a disproportionate amount of time to the rear where germs and bacteria lurks too. The app gives you the on screen encouragement to spend time reaching all parts of the mouth. The principle is great, although not perfect as you will find out if you read either our Genius 8000 review or Genius 9000 review but this will improve in time. 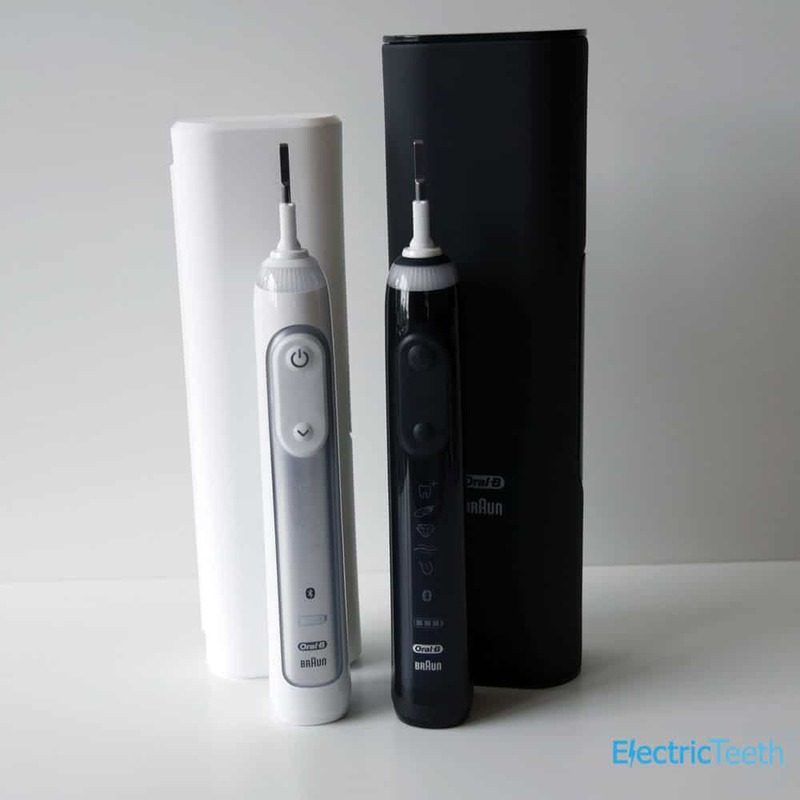 Here at Electric Teeth we like for users to get the best value you can from an electric toothbrush and the interchangeable heads means that you can share a brush handle with other family members rather than all having their own brushes that needs charging etc. Not only does sharing the brush handle reduce the amount in your bathroom it can reduce the overall cost as this is shared over more users. However do be aware heavy use will likely mean the brush will wear out sooner, but you have the option of a 3 year warranty with any of the Oral-B brushes discussed in this post. However this desire to share becomes lost if you want to take advantage of tracking and logging your cleans. Well whilst the brush will happily pair to different smartphones, it retains the data from the last 20 cleaning sessions on the brush. As the brush and phone sync via Bluetooth, this data is saved in the app and presented back to you. The problem is that if you share a brush handle not all the data on the brush will be yours and there is no way to pick or choose between these. So, if you and your wife share the same brush handle and she spends a total of 6 minutes a day compared to your 3, but you are the only one who logs the data in the app, your cleaning history is going to look quite mixed and give a better overall impression because of your wife’s thorough approach. Thus when it comes to encouragement, the app will give you less than you need, because you are not brushing enough. Now, if you are using the app only for the motion tracking as you brush, then well maybe you can get by with this. Such scenarios then lead to the need for separate brush handles, so each user can independently track. Enter the Genius 8900 (view on Amazon) and 9900 (view on Amazon). In a typical family environment, you don’t need more than one charging station or smartphone holder but the two brush handles might be an advantage and you gain better value from buying the 8900 over the 8000 in this particular circumstance. If all 5 members of your family want an advanced brush like this and to track their cleans, then I am afraid to report you will have to purchase multiples, the solutions are not that perfect! Whilst, in my opinion, the app tracking for more than one person are the real benefits of the dual-handled 8900 and 9900, for you there may be other reasons as to opt for this. So, hopefully, this clarifies and explains where the Genius 8900 and 9900 really come into their own and I shall now focus on comparing the 8000 with the 9000. Starting with the cleaning modes, the 9000 benefits from one extra cleaning mode, a tongue cleaner. This is not available on the Genius 8000. The tongue cleaning mode works best with the sensitive brush head, which is included with both models. The mode has a reduced run time and lower oscillation and pulsation count, which can be advantageous because the tongue can be sensitive and the higher power modes will likely make it difficult to do a proper job of cleaning the tongue. You do not ‘need’ to have this mode to clean your tongue but you may see the advantages. For further reading see our post on different cleaning modes and how they compare. It is worth noting that the lack of this cleaning mode does mean that the front panel on the 9000 does show an extra cleaning mode icon. The aforementioned cleaning modes work best with different brush heads, although there is nothing technically stopping you using any brush head with any cleaning mode. In the box with both the 8000 and 9000 you receive 1 x CrossAction, 1 x 3D White and 1 x Sensitive brush head, but the 9000 comes with 1 x FlossAction head also. There is a small benefit here and it allows you to try out the different heads and help you decide which you may choose to use. You can always purchase spares or change the brush head based on your preference or cleaning mode. The different heads do look to achieve different things and are not supplied just for effect. Click here to read about how the brush heads compare and what they do differently. Both the 8000 and 9000 come with a travel case, but this is another of the big differentiators between the two. The 8000 is said to come with a ‘premium’ travel case and the 9000 a premium case that also charges the brush and your phone. The use of the word premium is a bit of a stretch for the 8000 case. Yes it is a nice inclusion that does not come with many of the cheaper brushes and it is a bit better quality, but in my opinion, the smart travel case that comes with the 9000 is in a league of its own in comparison to the 8000’s. Instead of a thin, blown plastic shell, the 9000’s case is a solid, soft touch, smart, weighty and premium feeling option. Some of the weight comes from the electronics inside but just the look and feel is so much better. Sadly not even the 8000 case comes with a smartphone holder like the 9000 does, but the 8000 boasts the same smartphone pairing technology. The 9000’s case does have a USB port into which you can connect the USB cable for your smartphone or other gadgets to charge them via the case. The smart travel case does not have a battery built in and will only charge them when you connect the proprietary mains adapter to it. When connected, the brush in the case gets charged too. Both cases house the one brush handle and up to 2 brush heads. The Genius 8000 is available in white only, whilst the 9000 is available in black, white and rose gold colour options. The black brush handle looks smart, but the brush heads are white, which whilst a classic colour combination it would be nice if they matched. There is also a rose gold colour option. This looks very similar to the white brush, but the difference is that the inset on the front of the handle is the rose gold rather than a transparent/silver colour on the white model. Be it black or white the large rubber grip on the back of the handle is colour matched. That is it. The key differences explained. Just in case you have yet to do a lot of research or would like to know more, let me give a quick summary of where the brushes are identical. Both measure 24cm tall (with a brush head attached), 2.7cm wide and 3.2cm thick and weigh 140g. To the front, the lower third of the brush handle is where you will find the battery status. The battery icon is illuminated with a white light and the 3 bars deplete as the power reduces. When really low the icon will flash red. The battery built into these brushes is not all that big and lasts approximately 48 minutes or 12 days, based on one user. The charging stand that supplied has a 2 pin connector that attaches to a shaver socket in a bathroom (220-240v). If you do not have one, you can purchase an adapter to allow you to connect it to a conventional 3 pin UK mains socket. Above the battery icon are the icons for the cleaning modes, each one will illuminate as it is selected. To select the mode, use the down arrow selector key beneath the power button; both of which are firm to the touch and backlit. On the neck of the brush is a LED SmartRing that can be customised one of 12 colours, flashes at 30 second intervals when it is time to change quadrant and goes red when applying too much pressure during brushing. When the pressure is relieved, the light will go out. A 2 minute timer for the standard daily clean is built in and the audible and LED notifications to assist with achieving this (some modes last for more or less time). Any Genius model comes with a moulded plastic brush head storage compartment, complete with lid. Housing up to 4 brush heads, this housing snaps to the charging dock to provide a neat charging and brush head storage solution. A smartphone holder is provided too as a way to hold your smartphone and run the Oral-B app. Aside from the tongue cleaning mode, all Genius brushes have the Daily Clean, Gum Care, Sensitive, Whitening and Pro-Clean modes. Another noteworthy point that applies to both brushes is that Oral-B do supply each brush with a 2 year warranty, which can be extended to 3 years, if you register the brush online. This covers part failure and not things like user damage. An electric toothbrush will ensure a more regular and balanced clean across the teeth and mouth than manual brushing might hence you will often see claims of 100% more plaque removal. Where you may see some benefit is with the tongue cleaning mode on the Genius 9000. Many forget to clean their tongues, and whilst naturally cleaned by saliva, a quick clean with a brush can really help remove any lingering bacteria and freshen the breath. You could use any cleaning mode, such as daily clean to run the brush head across the tongue. However, the 9000 does have a special mode that lasts for 20 seconds and reduces the oscillations and pulsations to a lesser frequency, which is preferred when cleaning the more sensitive surface of the tongue. How desirable and beneficial this is for you will be a personal preference, but is arguably valuable long term to assist with optimum oral health. Yes, the Genius 8000 is the cheaper of the four brushes. Based on their recommended retail price (RRP) there is a £20 difference, £259.99* for the 8000 and £279.99* for the 9000; but the reality is there is just a £10 difference in the cost when actually buying the brush. This comes about because the brushes are so infrequently sold at their RRP due to the competitive sales nature of retailers. We have reviewed both the 8000 and 9000 in depth and at the time of writing they worked out at 15p and 16p per day to own, respectively, over the course of 3 years based on one user. Click here to find out how we determine the cost of ownership. Prices are always changing so if this is a big deciding factor, we advise calculating this at the time of purchase yourself. When there are so few differences between the brushes, deciding which one to go for or which to recommend becomes really difficult, but thankfully there are enough differences and personal circumstances that should help you decide. Do you want a dedicated tongue cleaning mode? If the answer is yes, go for the Genius 9000. Do you particularly want a black coloured toothbrush? If the answer is yes, go for the Genius 9000. Do you travel frequently and are often away for more than a ‘few’ days? If the answer is yes, go for the Genius 9000. Are you on a budget or particularly price sensitive? If the answer is yes, go for the Genius 8000. Are you keen to take advantage of the Oral-B position tracking technology, but share the brush with a partner or other family member who has the same desire? If the answer is yes, go for the Genius 8900 or 9900. The additional brush head with the Genius 9000 is neither here nor there in the decision making process. The biggest differentiator is the smart travel case and just how much you want to track your teeth cleaning. Whatever you choose, I am confident you will be impressed providing you make the most informed decision using the information provided. On reading this you may have found neither is right and there are many brushes from Oral-B you could consider. 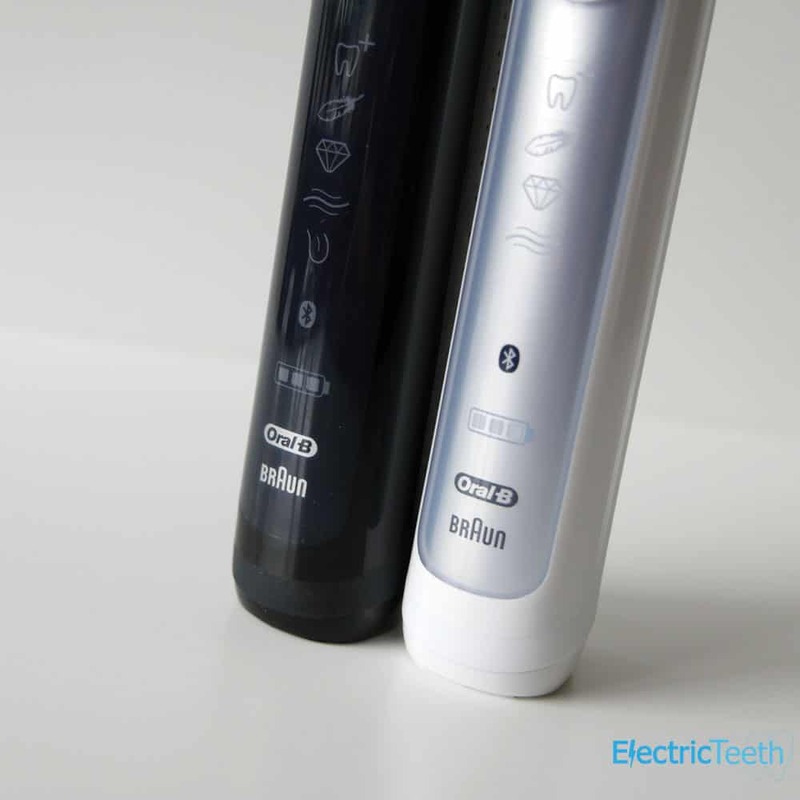 If so, we recommend checking out our best electric toothbrush comparison. Hopefully, we have presented the facts and made the whole decision process that little bit easier. If you found this useful, have any thoughts and opinions from going through this choice process yourself or have used either brush and want to comment, please do use the comments section below; what you have to say could be of real benefit to somebody else. *Please note any prices stated below were correct at the time of writing and may have changed by the time you come to buy. We always recommend checking the prices of several retailers before you make a purchase. In your piece on the Oral B 6000 vs 8000 (https://www.electricteeth.com/oral-b-6000-vs-8000/) you say the 6000 does not have tongue cleaning, but the 8000 does. And now you’re saying that the 8000 does not have it, but the 9000 does? I can entirely understand your confusion, but I am correct in what I have said in the articles. The key thing to note is that the Genius Pro 8000 is a model for the USA and the Genius 8000 (no Pro in the name) is a model for the UK, which is almost identical, but slightly different to the Genius Pro 8000. This comment has been left on the comparison on our UK website. However, the link you provide is to our USA website. So, this is all down to regional differences. I hope that helps. only the 10000 (or 9000 in the UK) has the tongue cleaning mode. But don’t worry about it. This mode is useless. It’s basically a Sensitive mode set to 20 seconds. Plus, they are better ways to clean to your tongue like using a tongue scraper. 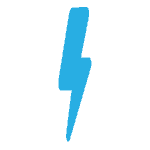 “Indeed, as standard, the 9000 stores brushing sessions in the handle and syncs up to the app any sessions that are not already on there. So if there are more than one user, other people’s brushing stats will be uploaded to the app. In order to maintain correct brushing records for each individual’s brushing statistics, the automatic synchronisation of cached brush data needs to be turned off. This is done in the left-hand menu: Settings -> toothbrush handle -> Automatic Session Syncing “off”. So it seems that 2+ users can sync their own brushing stats to their own phone as long as they have their phone within bluetooth range so the brush immediately sync the data to their phone. This is news to me and I will certainly be checking it out, testing and updating any articles as a result. This is a good option and one that may work for some people. I do think that for most, it is still far from ideal as it is not always practical to have your phone with the brush all the time, but it is without doubt a positive step in the right direction. Let me ask what is the difference between the 9000 and 10000. On the box of 10000 is writen: “Gum Guard. Up to 100% healthier gums and more plaque removal”. This is the only difference? Is this real difference or just a marketing on the box? We have yet to get hands on with the 10,000. This has been launched in a different country (Germany I believe) whilst we are based in the UK. However, for the most part, as I currently understand it, the Gum Guard is just marketing speak for we are promoting the pressure sensor that is built into the brush more. There may to be a slightly different charging stand, I await confirmation on this. I hope to be hands on within the next couple of weeks. From the 10000 Genius official video looks like, at he neck allerts with light if you push too hard to your gums. And in the video they mention 6 diferent cleaning mode but on the icons the same 5 simbols led than the genius 9000, so i dont know what should be the 6th element. Let me know if you have seen one 10000 in live, and you have more idea. The neck (or as Oral-B call it the Smart ring) lights up red on the Genius 9000 as well. The 9000 also has 6 cleaning modes of which only 5 icons show on the handle. I will advise as and when I know more. Thank you very much for all your informations!! I have been doing some more investigating and have an update for you. The official comment from Oral-B is, Oral-B Genius 10,000 celebrates the launch of two new colors: Orchid Purple and Midnight Black. Furthermore, the Genius 10,000, depending on the model, a brand new accessory set in the pack, such as an embossed travel case or a bag for the charger. It also has a major app update, Oral-B’s NEW Gum Protection Technology. This will also be available to users of the Genius 9000. What this means is essentially the Genius 9000 and 10,000 are the same. The difference is the 10,000 comes in Orchid Purple and Midnight Black, whereas the Genius 9000 does not. However, this depends on the country you are in, because in the UK for example, there is no 10,000 and the Genius 9000 actually comes in Orchid Purple and Midnight Black. The promotional video shows a new charging stand in the box, but hands on images of the box contents suggests this is not actually included. There are other models too, the 10,100s, 10,900. These are technically the same, but slightly different box contents. I can help you decide on a brush, if you need further help, but I could do with knowing what country you are in and what is important to you. hi there jon if i have model 8000 will it charge in the 9000 premium travel case ok? In the United States, the Oral-B Genius 8000 (I believe it’s the same thing as the Genius 9000 in the UK) is on sale for $85. The Oral-B Pro 6000 (the US does not have the SmartSeries 6500 and the Smart 6 6000 to my knowledge) is on sale for $49. Which would you prefer since the price difference is about $36? Does the 8000 have additional features that make the $36 difference worthwhile (i.e. tongue cleaning mode, more powerful, better travel case, travel charger, 2 more brush heads, position detection, phone mount, etc.)? I am not sure if the 6000 and 8000 have the same battery capacity and/or batter life. Lastly, do all electric toothbrushes have access to the FunZone feature on the Oral-B app? Thank you for the awesome reviews and advice. Keep up the good work. You are quite right, the Genius 9000’s US equivalent is the Genius Pro 8000. The US V UK range of brushes gets a bit confusing. The US Pro 7000 is equivalent to the UK Pro 6000/6500. We too have the Smart 6 6000 which is closest to the Pro 6000 in the US. With a lot of the price drops the Genius Pro 8000 is probably the all round better buy. It is ultimately personal opinion as to whether you feel those difference will be of benefit or not. The travel case and brush heads are worth something, but the position detection as clever as it is does take some dedication to make use of. The US Pro 6000 and Genius Pro 8000 have the same battery life. I believe all Oral-B Bluetooth enabled brushes have access to the FunZone when using the app. i have the oral b 8900,i would like to know the symbol on the toothbrush as the feather or the teeth+,refer to what mode ?? i would like your help also to know which mode is recommended for daily use and which is recommended for once\twice a week ?? The Tooth with the + icon is the Pro Clean mode. The feather icon refers to the Sensitive brushing mode. There is a mode that is not shown via the icons and that is ‘Daily Clean’ mode which is the default cleaning mode that most use everyday. You can use the Sensitive, 3D White or Gum Care mode everyday without issue and the other modes a little less frequently, but really it is your choice. You may wish to check out https://www.electricteeth.co.uk/oral-b-cleaning-modes-explained/ to find out more about each mode and how it works and which to use. Hi, thank you for the great help of your videos and website! I would like to buy an oral-b toothbrush and I selected the models with lithium battery , but I cannot decide for either 6000, 6500,8900 or 9000. I would like to get only the important features (e.g. I do not need the tongue cleaner). I wonder if the oral-b 6000 can be used with the position detection app.If I travel a lot worldwide which model should I choose, I read of the 100-240 v. I would like to have 2 handles if it is convenient.I am oriented to buy the 6000 or 6500 but I was wondering if I would missing out some important features coming with the latest models.I value durability and I read of people whose oral-b 8000 and 9000 stopped working quite soon, whereas I have not read anything like that for the 6000. The good news is that all of the brushes you are choosing between are fantastic! The 6000/6500 cannot be used with the position detection app unfortunately. If you would like to have two handles, the 8900 is a logical choice. In our 6500 vs 9000 comparison our overall choice was the 6500, all things considered. However, we comment that the distinguishing factor between the two would likely be the travel case: the 9000 does come with a fantastic travel case / USB charger. If you travel a lot, you may find this beneficial. But other than that, the lower price of the 6500 or 6000 tends to make them our recommendation. We haven’t seen reports of the Genius brushes being more faulty, but all Oral-B brushes do come with a 2 year warranty that can be extended to 3 years if you register the brush. More details here. Many thanks – made the decision for the 9000 vs 8900 very clear. Really pleased it helped. Which did you opt for and why? You talked about sharing handles and that it is not smart to do so as data get mixed up. What if 1 user has the 8900 with 2 handles. Does the data get merged or is it presented as the use of 2 different people? Hi John. Thanks for the comments. Sharing handles does really only work if you are not using the Bluetooth data functionality as you are right this would mess up the data. If 1 user has the 8900 with 2 handles and uses both handles for some reason as far as we are aware (not tested as an unusual setup) each brush would create a new ID/partnership with the app, but the app can only be connected to 1 brush. So the data would be mixed up and not merged, so stick to one handle. Thank you for this great research. It made me decide to go for the 9000. Hi Angie. Glad we could help. Please do let us know your thoughts on the 9000 once you have used it, we would love to hear what you think about it. Does the charger work across the full range of 110 – 240 volts for both 8000 and 9000 models? Hi Reg. The charging stand works on 220-240V when purchased in the UK. There is the premium travel case with the 9000 that comes with a charger that support 100-240V, but the conventional white charging stand would need and adaptor to work on voltages lower than 220v. Thanks for your research it is incredibly helpful! I have a question, is the base charger interchangeable between the different models (6000, 8000, 8900 and 9000)? I ask because in the photo showing the underside of the toothbrush, the holes where the charging nub is inserted look to be different sizes. We travel to the US a lot and I’d like to buy a US charger for when I’m there as the US bathrooms don’t typically have a shaver power socket and if I go that route I want to make sure the charger fits regardless of which model I buy. I’ve checked US Amazon site and the 9000 isn’t sold there! Thanks for the question. The short answer is yes. We have not yet come across a different charger for Oral-B models. I hope that helps. I have just got 9000 but with only 3 brushes no floss action. It shows 3 on the box but on the blogs and which reports states 4 brushes. I’m a bit disappointed as this is why I went for the 9000. Maybe it’s me wonder if you could shine a light on this. Depending on where you bought the brush, it may be a very slightly different model or variation of the Genius 9000. What 3 brush heads did you receive? Where did you purchase it from? Let us know and we will see if we can offer any more information or reason behind this. I have used my 6000 brand of electric toothbrush for as long as they have been available. The first 6000 came with a long enough cable. (1.2mtrs.) to reach my overhead shaver socket, but the later models changed they style of charger stand and skimped on the cable length, (down to .90Mtrs) which was too short to reach my shaver point. The battery is now on its last legs and I need to change. Have Oral B learnt a lesson and returned to the original cable length. If not it is not for me. I did contact oral B UK on this issue and their suggestion was to buy an adaptor and plug it into a 13 amp socket. I like my tooth brush in the bath room and as there is a Building regulation forbidding electric sockets within a certain distance of water a supply! what is the difference between genius 9000 and 9000S ? From what we can see the Genius 9000s comes with 2 x Sensitive brush heads along with a 1 x CrossAction and 1 x 3D White head whereas the Genius 9000 (non s model) comes with 4 different brush heads, 1 x CrossAction, 1 x FlossAction, 1 x Sensitive & 1 x 3D White. How long to the batteries in each last? Nobody tells you what mAh the batteries are in any of these toothbrushes. The higher the mAh – the longer you can run it for before charging again. Not sure on the exact mAh, but based on 2 x 2 minute cleans a day, you can get up to 12 days of usage or 48 minutes of running time out of them.